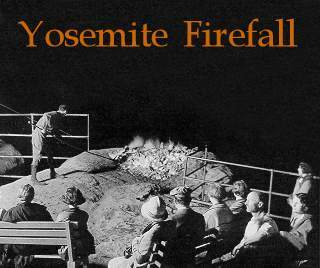 "My greatest thrill was being given the assignment of throwing the first Firefall from Glacier Point. Another fellow and I climbed the Ledge Trail to gather pine cones, start the fire and, at 8:30 pm, when the lights were out in the camp below, we heard the Stentorian voice of Foster Curry shouting, LET 'ER GO GALLEGHER." 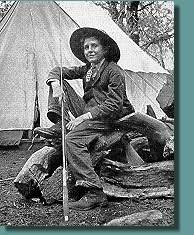 During World War I, one of the fire builders, Herbert Wilson, was urged by Foster Curry to put some zip into the Firefall. He made bigger fires, which created longer falls, and even established a record in climbing up the trail from camp to point in 54 minutes. Wilson worked the Firefall detail for 15 years. 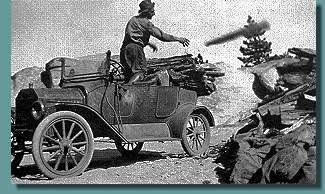 Another regular fire builder during the 1920's was Alex Beck who would use an open-roofed touring car to haul the red-fir bark for the fire down to the cliff's edge. He would light the fire an hour or so before 9:00 pm then push it off slowly with a long-handled rake. On one Fourth of July he pushed off three Firefalls simultaneously: a big one he dedicated to his wife, and two smaller, flanking ones for his two daughters. During this period, to insure proper timing, a light, that shone from the top of a tall pine tree in Camp Curry, was switched on just before the first call to alert the team on the cliff. When pipe railings were finally installed on the cliff's edge, the sign disappeared. Alex Beck chopped it up, mixed the wood in with the normal red-fir bark, and let it go over the edge with the next Firefall. When Foster Curry took ill with leukemia, he told his wife and mother that he wanted his ashes pushed over the cliff with a Firefall. But his mother refused, saying: "If that were done, I could never bear to look at a Firefall again!" He died in 1932, and a few months later, a small plane flew over Yosemite and scattered his ashes over the valley. At the onset of World War II, the Firefall was again cancelled, and was not reinstituted until after the war's end. 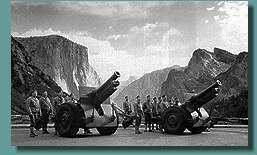 During the war,Yosemite Valley was used by the military. Camp 11, now known as Upper Pines Campground became a small army camp. And the Ahwahnee Hotel served as a navy convalescent hospital. "The request was given to the Curry Company and passed along to my father. I was twelve at the time. Together, we climbed the Four Mile Trail, still covered with snow at the top, and let ourselves into the boarded-up Mountain House, where we spent the night. The next day we built the fire, and after dark showed the army and everyone else a near record-sized firefall."